Ss. 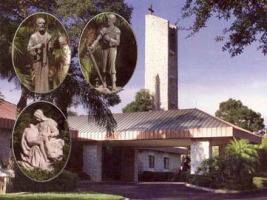 Peter and Paul The Apostles Church is part of the Diocese of Venice in Florida under the guidance of Bishop Frank J. Dewane. On January 7, 1987, Ss. Peter and Paul The Apostles was formed. Father Edward D. Moretti, Episcopal Vicar in the Diocese and former pastor of St. Joseph Church in Bradenton, was selected by the then Bishop John J. Nevins to be the founding pastor. The First Mass was celebrated on January 10, 1987 in the gymnasium at Sugg Middle School. Weekday Masses were celebrated in the auditorium at Freedom Village Retirement Center. Construction of the church, which is situated on a wooded forty four acre parcel on 75th Street West in Bradenton , was completed and dedicated by the Bishop on Sunday, November 19, 1989. In September of 1990, a Memorial Garden on the east side of the church was blessed and dedicated by Fr. Moretti. Construction on a 13,000+ square foot Parish Center began in September 1993 and was completed in April 1994. The final building phase of our parish was started in June 1998 and completed in August 1999. This last phase included a new Activity Center, Rectory and Priest Retirement Villas on the remaining 20 +/- acres, south of the Parish Center. The Activity Center is for all parishioners and includes basketball, volleyball, badminton and shuffleboard courts, a card game and crafts room, exercise room and youth room. These facilities were blessed and dedicated by Bishop John Nevins on Sunday, October 17, 1999. The parish is very active spiritually, liturgically and socially and over five hundred volunteers give their Stewardship of time and talent to help make it so.